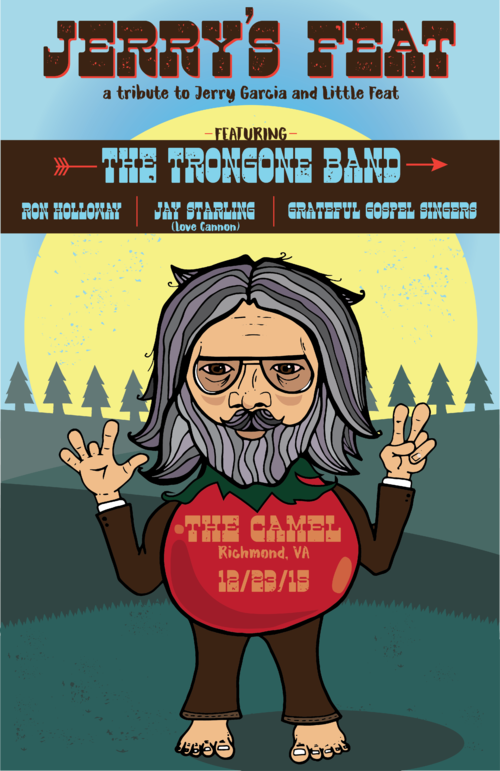 This past Wednesday at The Camel in Richmond, Virginia, The Trongone Band assembled an all-star show to celebrate the music of the late Jerry Garcia and Creole southern rockers Little Feat. Joining The Trongone Band were Ron Holloway, tenor saxophonist and longtime Warren Haynes collaborator, Jay Sarling of Love Cannon, and the Lockn’-famous Grateful Gospel singers, who derive from Keller Williams’ More Than A Little. Set one moved into a comfortable start with Jerry Garcia Band’s cover of the soulful tune “Don’t Let Go”, followed by Jimmy Cliff’s “Harder They Come”. Midway through “Harder” it became clear that this was no ordinary collaboration of musicians. The formula of a sing-along party led by the Grateful Gospel singers and lead singer Andrew Trongone, followed by mind blowing licks traded between Starling and Holloway proved to be the perfect recipe to have The Camel packed and rocking. By the first set closer, Little Feat staple “Dixie Chicken”, not only was the area up close to the stage packed and grooving, but the benches and chairs were also occupied with dancing individuals. Set two gave the Gospel Singers more of a chance to shine, lending lead vocals on “Fat Man in the Bathtub”, “Willin’” and “I’ll Be With Thee”. Starling hung back for the majority of the set, but Andrew Trongone filled any space he may have left, pushing Holloway into some of the most intense jamming of the night. The Grateful Dead’s “It Must Have Been the Roses” provided a much needed ballad section nearing the end of the night, before roaring back into the double header of “Skin it Back” and “Spanish Moon” to close things out. Throughout the show, the reverence these guys have for the music of the two bands was obvious, as well as the amount of fun they were having. With Richmond, Charlottesville and D.C. being the origin of most of these musicians, perhaps there are similar gatherings to be had in the future.